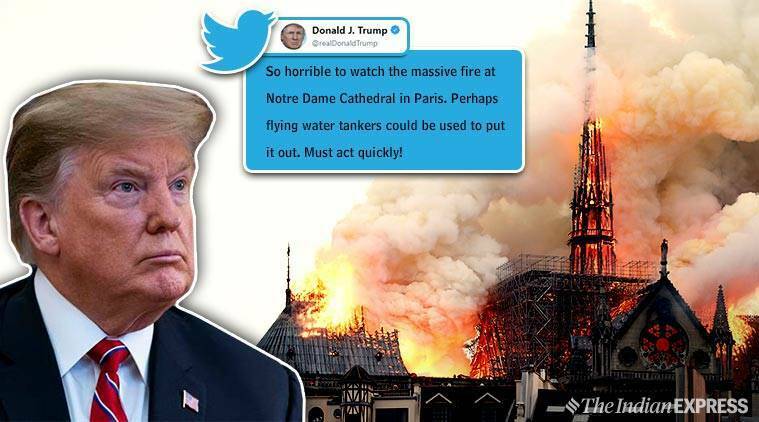 US President Donald Trump was criticised after he suggested France should have used “flying water tankers” in order to put out the massive fire that broke out at the Notre Dame Cathedral in Paris on Monday evening. “So horrible to watch the massive fire at Notre Dame Cathedral in Paris. Perhaps flying water tankers could be used to put it out. Must act quickly!” tweeted Trump. However, Trump’s suggestion to France, where over 400 firefighters worked together to contain the fire and prevent the 850-year-old Gothic building, did not go down well with many, who slammed the US president for the “ignorant suggestion”. “This honestly could have been a perfectly fine response if you would have just offered your support instead of ignorantly suggesting random actions without any command of the facts or the situation on the ground…,” responded a user to Trump’s post. Interestingly, the official Twitter handle of France’s civil security forces also responded to Trump’s “flying water tankers” suggestion and enlightened him that the use of water-bombing aircraft could lead to the collapse of the building.